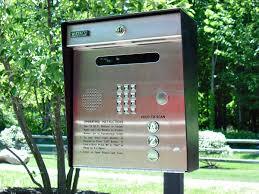 Telephone entry systems in Thornhill is a viable method for access control in the home or business. Thornhill Locksmith is a reputable service provider that has installed countless systems like these for the residential and commercial community in Thornhill, ON. Our highly trained staff will set down with the customer to help them determine which telephone entry system would best meet their requirements. A large company or residential complex might need a more advanced system that could suffice hundreds of users. A single residential dwelling would be well suited with a less sophisticated device. The customer can choose from numerous options including a telephone entry intercom or a telephone entry system with camera. The possibilities are virtually endless and our experts provide exceptional telephone entry systems installation that makes the entire process a reality. At Locksmith Thornhill we are committed to installing the right system for every situation. These systems are very easy to use. They can be beneficial to gated communities, apartment complexes, or gated homes. We can install wonderful systems that are geared for maximum security in major commercial or industrial locations. In any case these devices are installed at the port of entry, which are in most cases is a gated area. If it is a gate to an apartment complex or gated community than the guest might enter the number of the residence. When the person in the home answers the call they will be able to hear the voice of the guest and will be able to grant entry by pushing a number or refusing entry by ending the call. Telephone entry systems in Thornhill can work in a number of ways. If the guest is approaching a big company the system might have a lighted dial listing codes for various departments. The guest will enter the code and talk to someone in that area. Telephone entry systems are just as effective for a single home or a small business. The system is a very efficient method of access control. Thornhill Locksmith is an expert in this field and we take great enjoyment in helping our customers take control of their security.